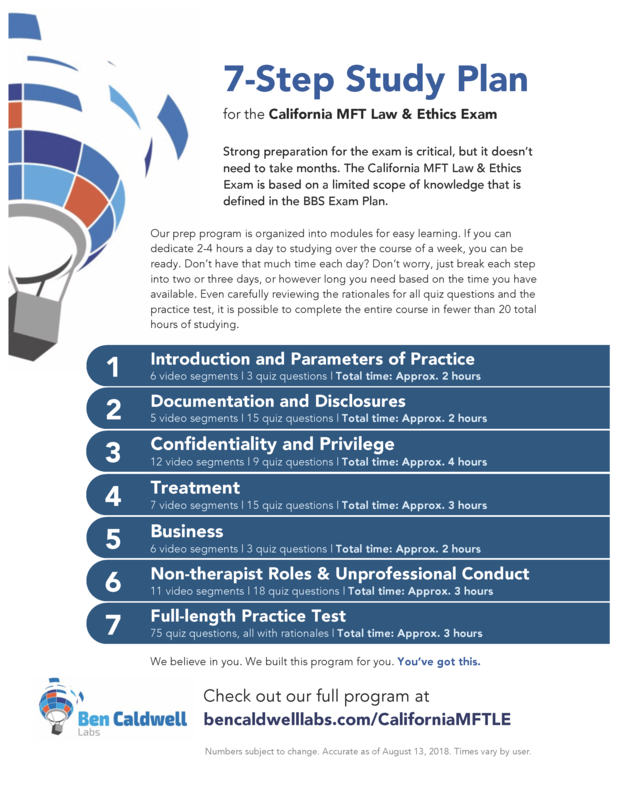 A California MFT Law & Ethics Exam prep course is supposed to give you a good, broad overview of the legal and ethical standards for MFT practice — just like a 12-hour law and ethics CE course should. And if a 12-hour law and ethics CE course is good, it should leave you well-prepared to take the exam. So we made them the same. We’re proud to announce the launch of our new California Law and Ethics for Marriage and Family Therapists course. It’s Law & Ethics Exam prep and 12 hours of continuing ed, rolled into one. 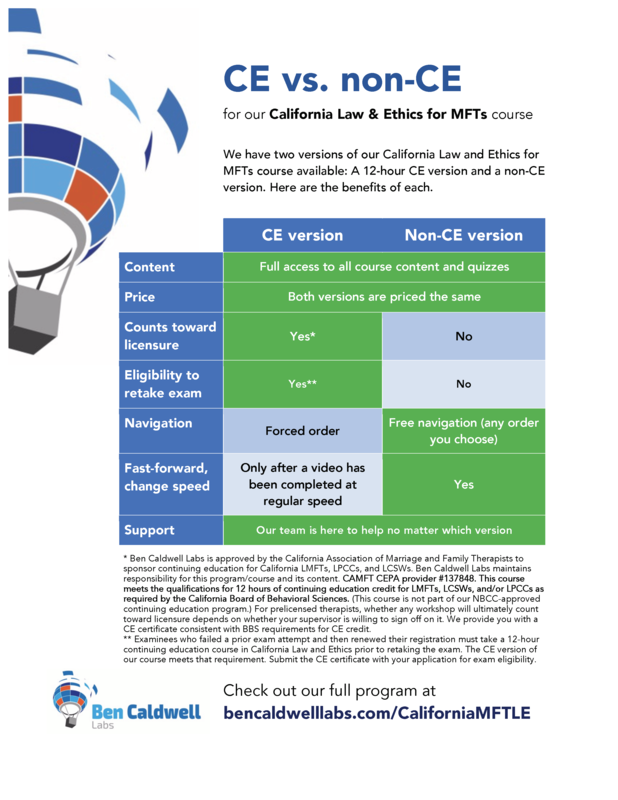 I’ve been proud to offer law and ethics training to California MFTs for more than a decade. My Basics of California Law for LMFTs, LPCCs, and LCSWs is a mainstay in law and ethics courses in grad programs around the state, and my MFT L&E exam prep books are inexpensive and well-liked resources. But it was time to update them, and there have always been two criticisms of the books that actually kind of had a point: 1, the study guide (the blue book) needed more case examples to show how the rules are applied, and 2, the practice tests (green book) didn’t give you the opportunity to test yourself on a computer, in conditions approaching the real exam. We’ve addressed both of those in the creation of this course. In order to make our course count for continuing education credit for those who need it, we had to put in some restrictions: You can’t skip ahead on the videos, for example, and you have to complete the course components in order. But once you complete the CE version of the course, you’ll get a CE certificate, which can be used as hours toward licensure (in the Workshops, trainings, and seminars category, assuming your supervisor is willing to sign off on it, as they should). That certificate can also be used for eligibility to retake the exam if you previously attempted the exam, didn’t pass, and then renewed your registration. Of course, not everybody wants or needs the CE hours. And lots of folks want to be able to skip around, play videos at higher speed, and just do the parts they already know they’re weaker on when they do law and ethics exam prep. So we also have an exam-prep-only version that has none of the CE restrictions, and doesn’t offer a CE certificate. If you like listening to podcasts and lectures at 1.5x speed, as I do, you’ll appreciate that speed-selection feature in the non-CE version. We built our whole mission around helping you succeed. And we’ve had, um, a few things to say about the exploitation of early career therapists. So when we were planning this course, we all agreed that we didn’t want to do it unless we genuinely believed we could provide both the best content and the best value of all the exam prep offerings out there. We think we’ve done it. And we’ll be continuing to develop and upgrade our course based on your feedback. One thing you’ll notice we didn’t include is upgrade options. Look, we’re pragmatic: If you believe that exam coaching, tutoring, or other services will help you on your exam, do them! But we didn’t want to hold anything back just for those who could afford to pay extra. Our course is sold as a single unit. Everyone who signs up for the course gets all of the course content. And that includes a Resources section where we’ve included some optional material on mental preparation for the exam, test-taking strategy, and more. That stuff doesn’t count toward CE, but it’s there if you want it. That also means that everybody who signs up for our course gets our whole team’s support along the way. The course includes instructions for contacting our support team whenever you need it. We’ll do our best to give a prompt and useful reply, most likely coming from Jeff Liebert or Emma Jaegle, both of whom are amazing (and have written for this blog). This course has been a long time in coming. We hope you find it useful. We are, as always, proud to call you a colleague. Head over to our Facebook page to see our launch discounting. We think you’ll like what you find.